Multi-store ecommerce setup as we already know is a shortcut to get multiple benefits from having a number of storefronts dedicated to diverse users, products or geolocation. We have already discussed how StoreHippo ecommerce platform makes it easy to launch a store with multiple storefronts that are not only easy to manage but also help you take your brand to new heights. You can not only enhance the online shopping experience of your customers but can also be assured of better business and growth opportunities in this setup. The multishop website has some practical advantages in a regular store or having multiple stores. A multi-store setup gives you tremendous flexibility to experiment and explore. It makes it easier for you to understand the unique behavior pattern and purchase choice of segmented customers on each store. This input, when combined with the right marketing mix, results in higher profit margins and gives you the opportunity to make quick improvements in each store for better results. Offer a set of products exclusively on each store. Apply special discounts for single or basket of products to improve ticket size. Set different discount coupons across the storefronts to attract new as well as repeat customers. Quickly replace the non-performing deals with the best-performing ones. Analyse the best performing time slots on each sub-store. Offer special limited period deals and coupons to maximise sales during these time slots. Optimize shipping costs with different pricing on sub-stores. Offer personalized deals for repeat customers. Offer special pricing for target customer segments. Multi-store ecommerce makes it easy to target global markets. All you need is a flexible and scalable platform that supports your business idea and allows you to explore new markets for your product or services. Location-based multiple storefronts can be easily rolled out for diverse geo locations that cater to the unique requirements of your target audience segments. Create a personal connection with your customers by offering storefronts in their local language. Offer native currencies as the payment option to avoid hassles of the exchange rate. Offer local logistics services on each storefront designated to a given geolocation. Apply different tax rules on the multi-shop website depending on the tax regulations of a given country. Offer local payment gateways to facilitate seamless checkout. Setup pricing overrides based on product quantity or customer segment. Set up different Festive season sale offers depending on the native region of the sub-store. Optimize keywords to suit local search preferences in English or native language. Design store themes that have elements of native culture and heritage and resonate well with targeted customers. It is easy to create an online store but to enhance the online shopping experience of your customers on multiple storefronts needs some thoughtful planning. When you create a customer friendly sticky site with seamless shopping experience your customers keep returning for more. In a multi-store environment, you can achieve this in less time using the inherent features of the setup. Set up different storefronts for each category or product in your inventory for easy navigation. Offer seamless checkout with single shopping cart across all sub-stores. Offer faceted search to make search easier on the multi-shop website. Offer smart pricing comparisons between different product types for informed buying decisions. Setup social logins for quicker login and faster checkout. Offer choices of shipping and payment options to your customers. Give personalized deals to repeat or new customers based on their buying behavior. Offer best selling products on special discounts across stores using the common inventory. Offer one-click checkout process to make online shopping easier on mobile devices. If you have ambitions to take your online business to customers beyond geographical boundaries and want an enterprise solution you should consider opting for multi-store setup. 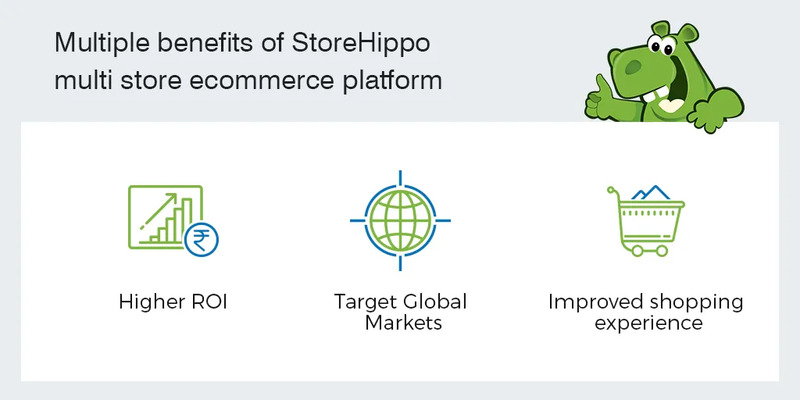 StoreHippo offers one of the most comprehensive solutions supported by the best multi-store ecommerce platform to give your business a head start. You can easily implement all of the above on your store using a gamut of tools and features provided by the platform. Leave us a comment below if you have queries or want to know more about StoreHippo multi-store feature.